In the increasingly competitive luxury automobile industry, BMW of North America needed a way to bring together existing independent programs targeted at Customer loyalty through the duration of a financed or leased automobile, bring back previous BMW owners, and target owners of competitive vehicles. CCG was called upon to develop a powerful, flexible system capable of delivering highly personalized and relevant webpages, produce personalized e-mail and print relevant, focused, direct mail marketing. The system was capable of rapid application development and the quick changeover of imagery, copy, and the unique consumer offer. We also provided real-time detailed metrics so the marketing group could respond quickly by adjusting, removing, or updating offers as needed. Detailed information was provided by offer type, by dealer, by vehicle type and by owner demographic. Working closely with the BMW Marketing Group and BMW’s Advertising Agency, CCG brought all the needed resources together necessary to develop the total solution. CCG’s powerful composition system provided the backbone. We developed a web infrastructure that delivered a highly personalized, relevant, and consistent consumer experience. This production system also delivered consistently branded e-mail and digitally produced direct mail. CCG’s Data Management Team worked with BMW and their data company to drive as much relevance into the program as possible. 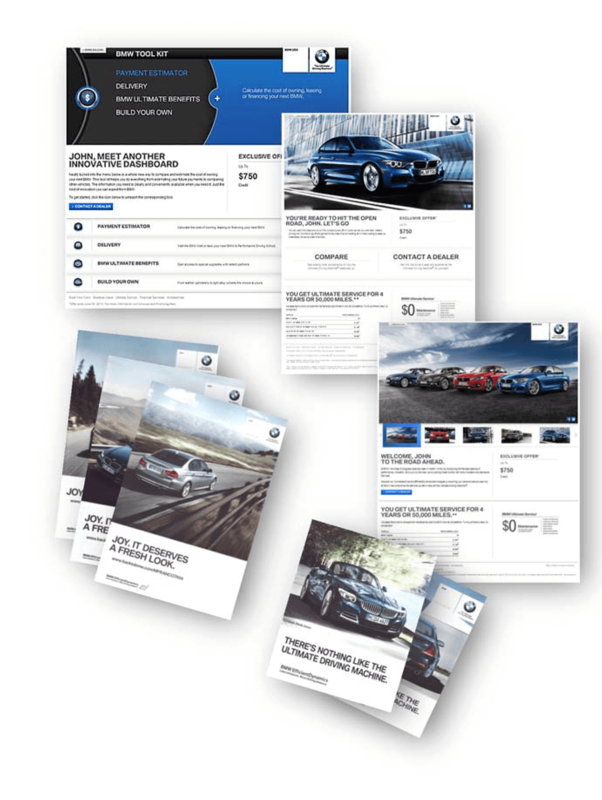 Real-time reporting and dashboards were developed and available online for BMW Marketing and their Agency to monitor and manage the campaign(s). By integrating the system with CCG’s mailing and logistics capabilities, we were also able to provide a methodology to dynamically adjust between USPS delivery methods depending on consumer demographic and seasonality. This helped focus the delivery and timing of key, timed marketing messages while reducing overall mailing costs. Conservatively, for the past 18 months, CCG has tracked the sale of more than 34,000 BMW automobiles through the program. This program has been a huge success and is now being more tightly integrated into Social Media.